… is a great way to recognize a colleague who has earned the respect of others. 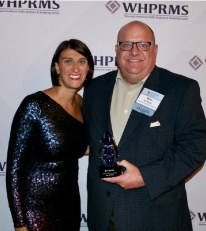 If there is a person you admire in the healthcare industry, if they have been your mentor, your confidant, your beacon in the fog, or perhaps it is just blatantly obvious they really know their stuff― Then nominate them for WHPRMS’ Professional Excellence Award before the end of August! Only one individual is awarded this distinguished honor every year! This person should be a leader inside and outside their organization. They should be a WHPRMS member in good standing and a seasoned professional who has demonstrated and shared their knowledge, advancing the principles of communications, marketing and public relations within the healthcare industry. To be considered as this year’s distinguished professional at WHPRMS’ annual conference, nominations must be emailed before the end of August. Be current members of WHPRMS. Have 10 or more years’ experience in planning, marketing, or public relations/communications, including at least five years of direct involvement in the healthcare industry. Innovation in the practice of strategy development through the use of solid marketing, public relations, or planning techniques, including (but not limited to) new product development, product line management, sales, community relations, environmental analysis, competitor assessment, needs assessment, forecasting or network development. Proven ability to produce outstanding work. Enhancement of the healthcare marketing/public relations profession’s credibility, including participation in professional organizations at a leadership level, publication in professional literature or professional public speaking engagements. Willingness to share skills and help others learn and grow. Exceptional personal qualities and leadership abilities, such as integrity, the ability to work with diverse groups, a record of motivating or mentoring others and exemplifying the values and ethics of healthcare marketing/public relations to people in other disciplines and fields. Examples from inside and outside of the workplace are welcome. Community service/civic achievement on a local, regional or national level. 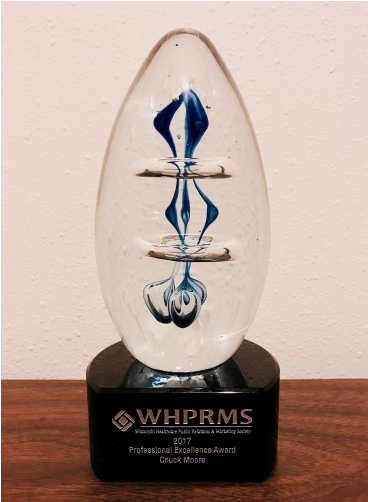 The award will be presented to one deserving individual at WHPRMS’ Annual Fall Conference.